It's nearing Valentine's Day, and though my sweetheart and I don't usually do gifts, I wanted to make her something special. We're not big on the whole Hobby Lobby, scrapbook-y, shrine to ourselves approach to artwork, but I did want to incorporate a personal element. 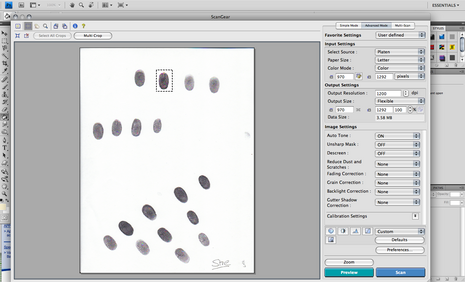 I recalled the custom DNA portraits I'd seen, and when searching, found the fingerprint prints offered by the same company. While I wouldn't even begin to understand how to go about visualizing DNA, I figured the custom fingerprint approach was probably pretty achievable. 1. 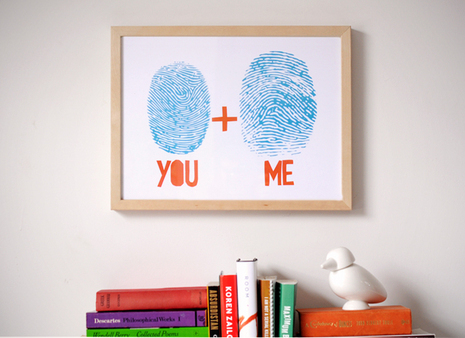 Begin by inking your fingers and making several prints on paper. Don't go for the roll-y effect they do at the police station (it was for a job, I swear), but the oval versions like you made in kindergarten. Don't worry about getting it too dark; it's more important that the friction ridges and negative space are separated rather than high contrast. Take several prints, re-inking your figures multiple times and making lots of prints. Be sure to label which prints belong to whom. 2. Select a print you think will work the best. Scan it at the highest resolution you can get, at least 600 dpi, but preferably 1200 or 2400. If your scanner can't do hi-res, go to the local copy shop and have them do it for a few dollars. Be sure you only select one or two prints, as resolutions this high can make for very large files. 3. 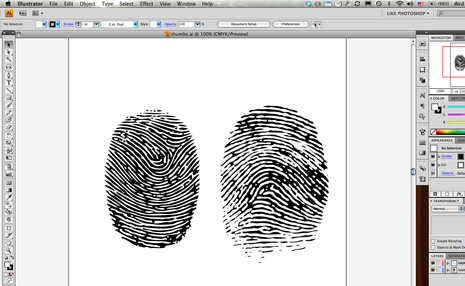 Once your have your print in bitmap mode, play with it in your graphics software to clearly define the lines. I'm using Photoshop, but you could try the freeware alternatives available. [See this link for options] Play around with contrast, levels and curves, or even the filters (like stamp or posterize) to get as much contrast as possible, minimizing the gray between the friction ridges. You might need to go in and manually erase any bleed. 4. 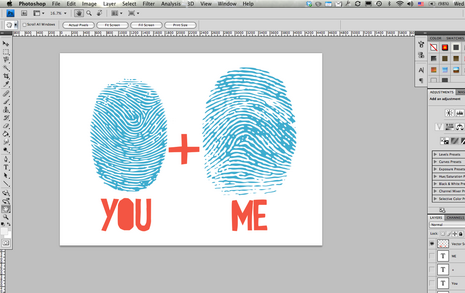 When your satisfied, you'll want to convert your image to a vector file, so that you can scale it to any size you want. 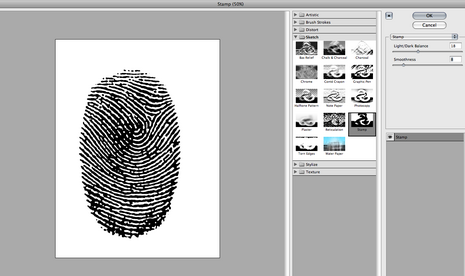 If you're not going for a huge final printed piece, you might be able to get by with just the hi-res scan, but it's worth playing around with the vector conversion, as it will continue to clean up your fingerprint. I imported mine into Illustrator and used the Live Trace functions, but there are free online raster-to-vector options like VectorMagic or Raster to Vector Converter that will work. One of your friends probably has Adobe suites, or your local print shop will as well, so you might be able to ask nicely and have them convert it for you. Printing options are up to you. 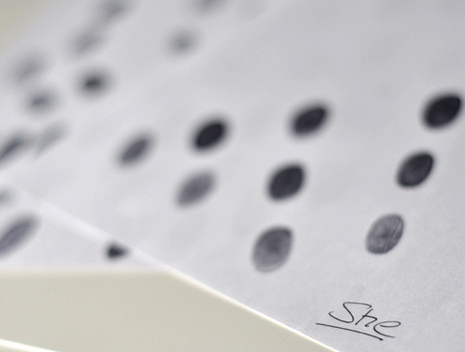 You could do something as easy as printing it at home, or get all fancy and make a screen print. I opted to go to my neighborhood print shop, and had them make a giclee print for $6, which is an archival ink-jet option that's much less costly than four color offset printing. It's not guaranteed forever - around 60-75 years, but that's good enough for me. Be sure to save your file at 300dpi! See how fun that was?! If you have any questions, feel free to email me at Chris@manmadediy.com. If you give it a shot, we'd love to see a photo.